Sales of plug-in electric vehicles in the US began accelerating during the third quarter of 2018, as Tesla ramped up production of its Model 3 battery-powered sedan. Tesla sold 55,843 Model 3 electric cars during that 3-month period, along with 14,470 Model S and 13,190 Model X for a total of 83,503 electric cars. far surpassing any other worldwide automotive manufacturer during that time. The closest competitor to Tesla was GM with sales of 3,949 Chevrolet Bolt EVs and 5,429 Chevrolet Volts for a total of 9,378 plug-in electric cars during the same 3-month period. Nissan sold 3,767 LEAF electric cars during Q3 2018. Plug-in hybrid electric car models from Toyota and Honda have been surging, with the Prius Prime selling 6,268 models and the Honda Clarity plug-in hybrid EV selling 5,298 vehicles. The total amount of plug-in electric cars on US roads and highways is now on track to exceed one million vehicles since sales of the Chevrolet Volt and Nissan LEAF first began in 2010. During his 2011 State of the Union Address, President Barack Obama challenged the country to achieve a goal of one million plug-in electric vehicles on US roads and highways by 2015. Unfortunately, the state of battery technologies during that time, coupled with lack of recharging station infrastructure and lukewarm response from both automotive manufacturers and consumers, hindered realization of this goal during the four-year period that President Obama envisioned. It took incremental, breakthrough technology achievements from Tesla, Inc. during the last seven years and eventual commitments from China, India, South Korea, Norway and Germany, to push global automotive manufacturers to accelerate the rollout of new electric cars worldwide. Plug-in electric car sales are accelerating at a rapid pace during the first nine months of 2018. Graphic Image Courtesy of Electric Drive Transportation Association. During January 2018, monthly sales of both plug-in hybrid electric vehicles (PHEV) and battery-powered electric vehicles (BEV) were plugging along at about 10,000 units per month as they had the previous year. 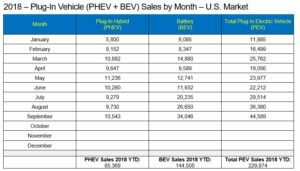 After Chevrolet rolled out the Chevrolet Bolt EV in all 50 states and Tesla production of the Model 3 surged during March 2018, US sales jumped to about 20,000 units per month for the second quarter of the year. Volkswagen Electrify America map of proposed DC Fast Charge station site locations within U.S.
Commitments by Volkswagen and its Electrify America program to build out DC Fast Charge station infrastructure across the US, coupled with the Tesla Supercharger station network and efforts by multiple states to cooperate on roadside interstate highway development efforts, also contributed to more interest by consumers towards EV sales. During July, combined PHEV and BEV sales reached 29,514 units. August saw another significant increase to 36,380 units. September saw another jump up to 44,589, almost four times the amount of plug-in electric vehicles sold during the month of January 2018. Another factor driving US electric car sales up through the fourth quarter is the potential expiration of federal tax credits of $7,500 for both Tesla, Inc. and GM, as each company reaches a cap of 200,000 units per manufacturer. If the US Congress does not extend these caps, then buyers must take delivery of a Tesla or GM electric vehicle by December 31st, in order to receive the full $7,500 credit. During the first six months of 2019, the credit is cut in half to $3,750. During the second half of 2019, the credit is halved again to $1,875. During 2020, Tesla and GM EV buyers are no longer eligible for the federal tax credit. This should put even more upward pressure on delivery of Model 3 cars to buyers who have placed $1000 deposits, despite recent financial management missteps by Tesla, Inc. CEO Elon Musk during the last two months. 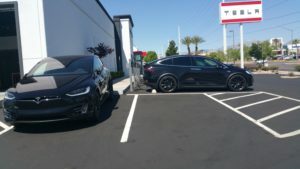 Tesla High-Power charging stations are available for refueling new Model 3, Model S and Model X electric cars for Tesla owners at the Las Vegas service center. Tesla service centers are being flooded with Model 3 vehicles nationwide, in an effort to get as many vehicles delivered before the end of the year. 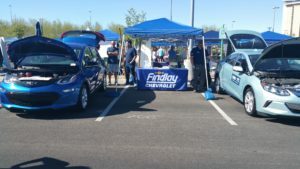 Findlay Chevrolet featured a 2018 Chevrolet Bolt EV and 2018 Chevrolet Bolt plug-in hybrid within the Clean Energy Drive. GM dealerships nationwide will also be under the same pressure from consumers to deliver Bolt EV and Volt models before December 31, 2018. 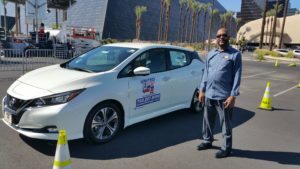 Roland Lewis, sales specialist at United Nissan, chaperoned test drives of the 2018 Nissan LEAF during The New American Road Trip event. Meanwhile, other automotive manufacturers like Nissan, BMW, Honda, Mitsubishi, and Jaguar Land Rover have not yet reached sales of 200,000 vehicles within the US and are still under this cap. These companies are introducing newer models of electric vehicles with longer range during the 4th quarter of the year, as well. Automotive manufacturers who entered the EV market later than Tesla and GM still retain space under their 200,000 vehicle cap limitations to sell additional new models during 2019 and beyond. Jaguar Land Rover Las Vegas showed off a new electric I-PACE electric SUV crossover that will compete against the Tesla Model X. 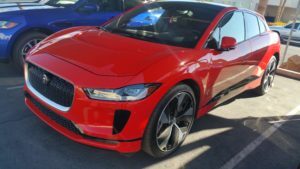 Look for the Jaguar I-PACE to be available at local Nevada dealerships by December 2018 to compete against the Tesla Model X electric SUV crossover. 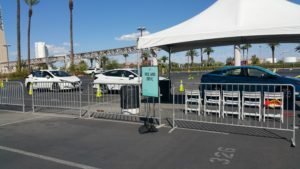 A Ride ‘n Drive event during The New American Road Trip encouraged test drives in 2018 models of a Nissan LEAF, Honda Clarity PHEV, and Toyota Prius Prime. The Honda Clarity plug-in hybrid is a solid competitor to the GM Chevrolet Volt with a 45-mile electric-only range before the hybrid gasoline engine takes over to increase total range. Other plug-in hybrid EVs available locally during the 4th quarter of 2018 include the Toyota Prius Prime PHEV, the Mitsubishi Outlander PHEV, Ford Fusion Energi, and the Chrysler Pacifica PHEV. 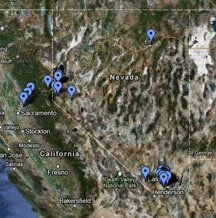 Electric car adoption seems to be accelerating at a rapid pace, mostly due to the efforts of Tesla.